Question: What weighs 4 ounces and has traveled 350,000 miles in its lifetime? 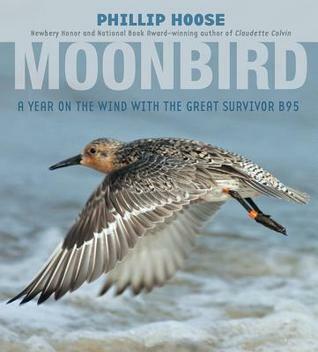 Moonbird: A Year on the Wind with the Great Survivor B95 chronicles the plight of rufa red knots. These tiny shorebirds spend the winter in Argentina where it's daylight more than twelve hours of the day; the extra daylight allows the birds to easily see their prey of worms and clams. In the spring, the birds begin an 8,900 mile journey from the Argentina to the Canadian Arctic where they will nest for the summer before returning to the south in fall. Unfortunately, the rufa red knot population is in a sharp decline for a number of reasons including overfishing of horseshoe crabs. Against all odds, one bird (named B95 from the code on his band) has survived for close to twenty years. B95 is affectionately called Moonbird because in his lifetime the bird has flown the distance it would take to reach the moon and halfway back to earth. What makes this particular bird so strong and resilient in the face of adversity? 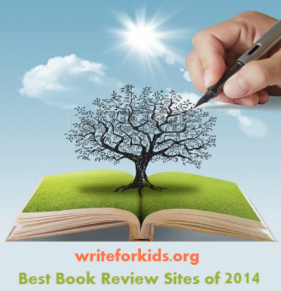 The first person narrative style and descriptive writing will appeal to middle grade readers and to teachers in search of an engaging nonfiction read aloud. Hoose includes himself as a figure in the book. Hoose was invited to take part in rufa red knot counts in Argentina and New Jersey. He worked with teams of biologists to band, weigh, and measure the birds. This personal connection to the story helps readers feel like they right there with scientists in Tierra del Fuego and Delaware Bay. Hoose also uses elements of mystery to keep readers hooked. Questions are posed throughout the book about the location of B95. Will he be spotted again? Why is the population of rufa red knots dwindling? Not only does this technique hold the attention of readers, it's also part of scientific inquiry. The chapters are arranged chronologically to follow the migration pattern of the rufa red knots from October of 2009 to October of 2010. Maps are placed in each chapter to provide readers with geographic information. The most impressive map, located near the front of the book, is a two-page spread showing the flight legs of the rufa red knots from the southern tip of Argentina to the northern part of Canada. Each stopping point is marked and labeled. Numerous photographs of flocks of rufa red knots and photos the land in Tierra del Fuego, Delaware Bay, and the Canadian Arctic are placed throughout the book. Between chapters, Hoose includes profiles of scientists and environmentalists who have worked to save the rufa red knots. Clive Minton's work is featured in one of the profiles. He designed a special cannon net that researchers use to catch rufa red knots during banding sessions. The red knots are extremely difficult to catch. Minton's cannon net fires a rocket attached to a net that temporarily traps the birds without injuring them. The researchers untangle the birds one by one as they record the bird's band number and weight. In addition to profiling scientists, Hoose writes about students who have worked to preserve the red knot population. The last chapter of the book, Extinction is Forever, asks readers why they should care about the population of shore birds. Hoose goes on to make the case for why readers should be concerned about the survival of the species. The Appendix provides readers with information about how to get involved in shorebird projects. Hoose provides extensive back matter at the end of the book including detailed source notes with page by page accounts of where he found the information. Hoose describes his research process at the beginning of the source notes; the process included reading many books and scholarly articles, interviewing experts, and conducting on-site research in Argentina and in Delaware Bay. Teachers and librarians should be sure to share the author's note with students as a model for quality research. I highly recommend this engaging nonfiction text for middle grade nonfiction collections. Budding scientists and bird lovers will want to read this book for pleasure, but they will have to pry it from the hands of grade 5-8 teachers who plan to read it aloud to students. 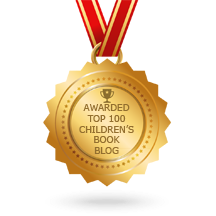 The book is an excellent model for science and writing classes and is the type of rich, narrative nonfiction referenced in the Common Core State Standards. You should order two copies to make everyone happy! Thanks for participating in today's roundup. As a Jersey Shore resident, I hear about the red knots, but I've never seen one. I'll have to check out Moonbird and see if B95 has been in my area. Thanks. Ooohlala! If the book cover is any indication, I'm sure that each page would be lovely. Thanks for the very thorough review.